The latest article to sweep the running world is Christopher McDougall's New York Times article and video on how to run. The article is harmless enough...obviously it's skewed towards McDougall's way of thinking, and like any opinion piece, it only shows one side of the argument, but it doesn't present anything that actually stuck out to me as factually wrong (unlike his book, which has some incorrect details like the assertion that Nike invented the raised heel, when there were actually running shoes with raised heels on the market before Nike was even founded). The video is...odd. McDougall comes off a bit like a car salesman, telling people that there is only one way to run and 85% of people are running "wrong," and then showing people how to do the same barefoot sprint drills that the rest of us have been doing for years, calling it a foolproof method to running the "correct" way. Only lots of people who are running "wrong" are pretty fast...and if someone has gotten themselves to the elite level running "wrong," are they really wrong? Interestingly enough, this article appeared on the same day that elite runner Kim Smith, with her bouncy, anything but textbook-perfect stride (but when you're that fast, who the heck cares how bouncy you run? ), had her interview posted on Running Times. Whoa. Well, that's kind of the opposite of what McDougall is saying. McDougall on the other hand, pushes to find the "best" way to run, which is, as he describes, "not the fastest, necessarily, but the best: an injury-proof, evolution-tested way to place one foot on the ground and pick it up before the other comes down." Except "not the fastest" probably won't help Smith this weekend in NYC, and I'd argue that if it's not the fastest, it's certainly not the best. I'd also argue that there is no "injury-proof" way to run, and even if you're running with a "perfect" stride, if you're pushing the limits and skirting that edge the way every competitive runner whose #1 priority is getting faster does, eventually you're going to mess up and step over that line and get hurt. But I digress. So, you all know that I'm a biomechanics nerd. What you probably don't know is where I actually lie on this whole barefoot thing, because I've tried to keep that out of my posts up to this point. Oh sure, I've pointed out that I don't think that messing with form is a viable substitute for hard training if you're serious about running faster. And I still don't think that playing with your form is a more effective way to run faster than training hard. No way in hell. But that doesn't really say where my point of view lies on the whole perfect form thing...it just says that I'm more of a fan of hard work than form changes. Really, as far as "perfect form" goes, my view is actually kind of close to what this guy says. Yeah, Pete Larson. The RunBlogger. Seriously. You surprised? Thought so...I kind of was too when I realized I was reading his stuff and agreeing with a lot of what he was saying. Believe it or not, I actually have a lot of respect for Larson and what he's writing. I don't agree with all of it, but I do agree with more than you'd probably think. If you read Larson's early stuff, he seems to start out more on the barefoot side than he is now. He placed a lot of emphasis on the midfoot strike, for example. And while he's still standing on the minimalist side of center, he's more centered than he has been in the past. (Or maybe he's always stood in the center, but his writing emphasis has changed, or maybe just my point of view reading his stuff has changed, or maybe I have Larson completely confused with another minimalist blogger in which case I apologize to Larson). When I look at my own stuff, I definitely started out as your typical physical therapy student, pointing out factors that contribute to pronation and writing a satire piece that was originally intended to poke fun at one of my minimalist friends. Now, don't get me wrong, it's not that I completely disagree with I've written in the past, because the things I talk about definitely do contribute to things like overpronation and supination. And I still don't think that everyone is able to go minimal (more on that later). However, my own view has moved a bit more to the center (albeit the opposite side of center from Larson), and I am now thinking that the exact same factor that prevents everyone from benefiting from a stride change to whatever McDougall's "perfect stride" is also prevents everyone from fitting perfectly into the current stability-pronation paradigm. That factor? Variability. If you want to read Larson's "opposite side of center from me" post on variability, it's right here. So keep that word in mind for me. Variability. Three very different strides. Caroline Kilel (closest to screen) is forefoot striking and carrying her arms super high. Sharon Cherop (behind Kilel) is midfoot striking and carrying her arms a bit lower. Desi Davila (Hansons singlet) has her arms the lowest and is heelstriking. Yet all three of these women are incredibly fast. (And please don't post any comments about how Davila's stride is "making your knees hurt" or "her heelstriking is why she's behind." There's enough of that in the YouTube comments and it's a pet peeve of mine. And YouTube guy who posted that heelstriking Davila is behind the Africans...Davila beat Cherop, along with the rest of the field! That means she beat all of the midfoot strikers, and only lost to one forefoot striker. So there). If there is only one perfect way to run, then two of these women must be wrong. In which case...I wish I ran as wrong as them! So if there's more than one right way to run, how do you figure out what the best stride is for you? I believe that your body is smarter than your brain, and your body will naturally and automatically figure out its most efficient stride with training. When you're running enough, and doing hard enough workouts, your body has no choice but to figure out what's the most efficient way to run. It has no choice but to be efficient, so it needs to figure out the best way to run for your personal biomechanics. You don't need magic shoes to do this. Oh sure, shoe companies that want to make money will tell you that you need certain shoes to run with good form, but you don't (you can't villainize traditional shoe companies for wanting to make money but then assume minimal shoe companies are different. I hear that argument all the time and it doesn't work. A company is a company and they all want to make money, which is fine by me because if they don't make money they can't make shoes that I like). All you need is a good work ethic and a determination to put in the work! I often hear the argument that cavemen ran barefoot. But at the same time, I highly doubt they were saying to each other "Yeah man, Grok said I was heelstriking on the soft grassy part of the plain today, so I'm working on moving to a midfoot strike." They were running whatever way their body figured out naturally, trusting their body to figure out how to run down prey while using the least oxygen and burning the least amount of precious calories (aka the most efficiently). And no, you can't heelstrike on pavement. Believe it or not, I have done a little bit of barefoot running before, and on pavement, I change my stride to a forefoot strike immediately (and I also get way slower, but I digress). But you can heelstrike barefoot on soft grass, so God only knows how cavemen were actually running, other than with a natural stride (that is, the stride that came naturally to them, not a stride that they forced because someone told them it was "natural"). So if you ask me how to develop an efficient stride, I'd probably prescribe speed development work: short, fast intervals with full-recovery. Go ahead and try to consistently work speed development workouts into your training and not develop a stride that's efficient for your personal kinetic chain...not happening! If you're still convinced your form is actually bad for some reason, Greg McMillan's Running Times article has some good advice. Focusing on running tall is, in my opinion, a safer and more effective way of fixing form problems than trying to alter the way your foot hits the ground. Now the shoes thing. Again, the key word here is variability. I don't believe that orthotics are evil. I think they're overdiagnosed, but they're no more evil than the very minimalist shoes that are no more than a thin piece of rubber with a thin upper. I think Vibrams are a little bit of a fad, that there's nothing special about separated toes, and that a very thin-soled minimalist shoe will function the same, but I don't think they're evil either. And really, since both orthotics and Vibrams have gotten people out the door running healthy (and maybe even fast! ), doesn't that make them both good, at least for those people? The important part is getting the right shoe on the right person. Not everyone can transition to minimalism. There are factors out of our control that all the stretching and strengthening in the world won't change. On the other hand, not everyone with "dysfunction" needs orthotics. Most of the time it's something training related that needs to be changed, sometimes strengthening and stretching can fix it, and yes, sometimes a change in shoe can help. I purposely cropped the head so you couldn't tell who it is. Those red lines show what appears to be overpronation and the hip on the swing leg dropping quite a bit during stance phase. If I had you play PT, what would you do with this runner? A year ago, I would have put her in stability shoes. Oh, wait...except that's Kim Smith. Oops. To be fair, I have no idea what kind of shoes she trains in, and she may very well be wearing a stability or motion control shoe for the bulk of her mileage. I am definitely aware of elites who wear stability shoes, so it's not outside the realm of possibility. 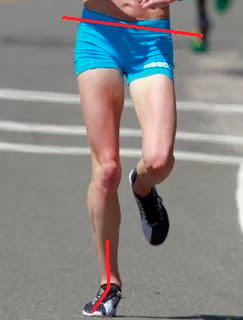 But she's racing marathons in flats, which means she's probably also doing at least some of her speedwork in flats, so she's obviously okay with some overpronation. Yet other people honestly do better in a stability shoe that controls their overpronation. And then one of the studies I read ended up with neutral runners doing best in stability shoes and overpronators doing best in neutral shoes. Well, crap. Which brings me to the next problem: different people do better with different kinds of shoes to control their different levels of pronation. If you're already running happy and healthy in some pair of shoes, you're doing something right. No need to change because Chris McDougall or someone in a store or your doctor or the shiny advertisement or anyone else tells you to. 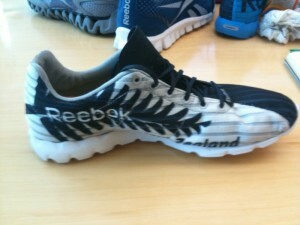 You're already in the right shoe for your personal biomechanics. And if you're just starting out and have no idea what kind of shoes to wear? I'd still suggest you start with a gait analysis, because I think it's a good starting point, but no way is it a be-all end-all. So where does this leave us? With a lot more questions, unfortunately, but with one big answer. It's that key word again: variability. We're all different. We shouldn't all try to run with the same stride, and we won't all do best in the same shoe, whether that's a minimalist shoe or a shoe that gives us textbook perfect pronation control. Oh, and one more thing. McDougall's 100-Ups? Dude, if he wanted to learn about them, all he needed to do was go observe just about any NCAA team! We've been doing barefoot sprint drills for years! Only we called this particular one high knees because it's more descriptive than 100-Ups. I wonder what he'd think of our other drills. You make too much sense. I'll never understand the obsession some people have with others' shoe choices and footstrike. One thing to consider with racing flats is that while many of us "need" (or want in my case) a stability shoe for the bulk of their training miles, going into a light weight neutral racing flat for races shouldn't cause any problems. My theory is that the training places a higher level of stress on the body, so you're getting the support when you need it the most. For race day, it's all about being fast and smooth (same goes for harder intervals or tempo days). After watching MacDougal's TED video a while ago, I still can't believe so many people look to him as the messiah of running injury free. OK, damn you for posting his NYT video... and to think that this guy makes a living off of selling his kool-aid. In 1874 they also thought that the best running form for sprinting was to hold your hands FLAT (parallel to the ground) for less wind resistance. In the middle of those "45000 that are doing it wrong" will be a host of his BF disciples that will be... doing it wrong. Ringo, I absolutely agree. 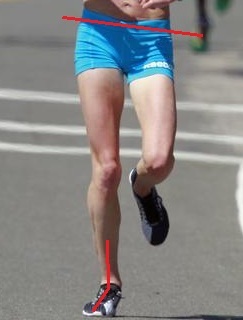 I definitely know of a lot of people who train in stability shoes and race in flats, and that may be the case with Smith (above), though I don't know for sure. And I completely agree with your reasoning! The extra stability will allow you to push the limits in your training, stressing the cardiopulmonary system and larger muscles, while giving the smaller muscles the support they need. Thanks Mooov Foreward! Great to hear the perspective of someone in the therapy practice. What about this food for thought: If individuals with less than optimal running form are running shoulder to shoulder with individuals with great running form, how far ahead would they be with better form? In theory, those with less than optimal form who are finishing with those with optimal form are more fit, since they are technically doing more work than those with better form, but finishing with them at races. That's the layman's version anyway. You can find the scientific literature on Google Scholar if you're interested. Also, you have to consider that everyone's running performance is made up of a variety of factors (VO2 max, lactate threshold, running economy, aerobic endurance, etc). It can't just be simplified to just form versus engine...way more to it than that. Shame on you for actually having the gall to question the veracity of a mediocre journalist who, at best, is a back-of-the-pack runner! Seriously, I just discovered your blog, and this commentary has me alternating between applause and laughter. Great stuff! Thanks Bruce! Glad you enjoyed, and got a laugh out of it! Can I ask you a question/opinion...I've having so many feet issues here and keep thinking it's lack of cushion in my shoes..been in Asics Keyanos and Brooks Adrenaline...I can run fine...just finished a 1:50 1/2 marathon which is a 15 min PR on a hilly course from a prev. flat...I've gotten faster, but also gone to more of a mid-foot stike b/c of the speed and increased turnover...Sooo, they analyze and reanalyze my gait and I do overpronate fairly significantly, but ow much is too much? my mid-foot hurts so much after longer runs...I have to rest for 2 days...I can hardly walk barefoot. I thought I had stress fractures after my 1/2 marathon...I was fine while racing, but after was terrible...and the top of my foot and lateral part of my shin is always sore....So, is the shoe over-correcting me? This is the only thing I can think...Unfort. I tend to run at 1 pace all the time...until it gets hot and then I'll slow down b/c I have to and then I'll run at a slower pace all the time...But I HAVE to find some shoes that work...I'm questioning neutral or less supportive? I thought it was just that Brooks were not cushioning me enough...but now my feet hurt after an 8 mile run in my Asics...AHHHHH...noone seems to know and its getting expensive and painful!! Thanks!! Jenn, there's a lot of stuff going on here. First, have you always had pain in the Kayano and Adrenaline? Or did this just start when you changed your footstrike? And did you change anything else too (volume/intensity/etc)? Second, understand that most likely, you got faster from more training and more experience. Third, different people are okay with varying amounts of overpronation...it's a very personal thing. Anyway, it's pretty hard (read: impossible) to diagnose you online based on a short text description, without actually seeing you. Why don't you drop me an email ( bpierotti@gmail.com ), and we can get into a little bit more detail as to what's going on here? From there, we might be able to at least get some ideas as to where to go from here. Amen! Everything in moderation...ain't that the way it is? I think we'll look back and laugh at Vibrams the way we do the 1970s Earth Shoes (remember them?--they were comfortable, come to think of it, after a while). And your point about working hard having more effect than being picky on form...I'm a middle school XC coach and we do work on kid's form, so they learn good habits early. But I have one kid, a 6th grade girl, who weighs about 0 pounds and is faster than all the boys. She flaps her arms like an angel on Skittles and Sunny D, and I've tried to correct it, but...she says "I CAN'T! That's just how I am!" And because she is a perfectionist who obsesses over her mile time (at age 11), I've decided to let it be. The last thing she needs is more stress. She'll figure it out herself - that tucking her arms in might reduce her wind resistance : ) . Anyway, thanks for the common sense. Very refreshing! Haha, I have the greatest mental image of this super fast girl flapping her arms around. But hey, if it's working for her...! Okay, I've got to ask: What is the One Perfect Way to run and chew gum at the same time? LOL! You're going to have to ask someone else that one...I'd probably asphixiate on the gum!